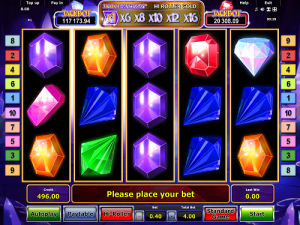 This slot, brought to you by NovomaticCasino.co.uk, is just jewel-erific! With amethysts, sapphires, emeralds, rubies, diamonds and more – this slot will dazzle and delight you with its colourful, sparkling symbols. Jackpot Diamonds has received countless positive reviews and this slot, jam-packed full of features, is sure to delight any slots fan - from beginner to expert. As with most other NovomaticCasino.co.uk slots, you can try it out for free until you’re ready to play with and start winning real money! The minimum bet is 0.10 so you don’t have to bet big bucks to enjoy this gem of a game. However, if you do want to raise the stakes, you can heat up the game by switching to the ‘hi-roller’ mode, where your bet will be multiplied by up to x10 with your winnings multiplied by up to x16! We like those odds! You can exit the ‘hi-roller’ mode at any point, simply by selecting ‘standard game’; just as you can change your bet at any time, by using the plus and minus symbols next to your bet amount. Your balance is clearly displayed for you at the bottom left-hand side of your screen, with your winnings to the right, and you can check the paytable, whenever you need, to check how much each symbol is worth depending on your bet. With 5 reels and 10 paylines, there are plenty of ways for you to win. In Jackpot Diamonds, a win isn’t just a win: it’s more than a win. Jackpot Diamonds has the classic double-or-nothing gamble feature which you can use each time the jewels fall in your favour – all you have to do is correctly guess whether the next card to be revealed will be red or black; get it right and you’ll double your win! The real diamond, on the other hand, is that this slot game has a ‘lock and spin’ feature. The ‘lock and spin’ feature works by locking in winning symbols and continuing to spin the reels for you, so each and every time gems fall in winning combinations across the reels, they’ll lock into place and the reels will carry on spinning. The winning symbols will stay in place and the reels will continue to spin as long as more winning symbols or combinations continue to grace your reels and will only stop when the screen is full of the same symbol or if a spin doesn’t supply another of the winning symbol. Jackpot Diamonds wouldn’t be living up to its name if it didn’t offer its players a jackpot, so what does it do? It offers you two! That’s right: Jackpot Diamonds has not only one, but two jackpots for the taking! Simply fill the reels with rubies or diamonds to be in the money. Think that sounds too difficult? Think again! With the slot’s ‘lock and spin’ feature, it’s easier than you think! Spin at least three on a winning payline to watch those jackpot gems lock into place and continue to fall on the reels! If you’re a fan of Diamonds of Fortune, you’re sure to love this jewel-erific slot, and if you’ve enjoyed Jackpot Diamonds, why not check out our other jackpot slot games such as: Diamonds of Fortune, Mega Joker and Reel King Potty. NovomaticCasino.co.uk also offer some excellent table games, including: Blackjack, Poker, Sic Bo, Royal Crown 3 Card Brag and Roulette, and some incredible live casino games which you can play for the ‘real casino’ vibe, such as: Live Baccarat, Live Poker, Live Blackjack and Live Roulette.